Disclaimer: The information on this web site is not an offer to sell a franchise or business opportunity. Such offers are only made to qualified individuals through delivery of a Franchise Disclosure Document. Certain states require that we register the franchise disclosure document in those states. We are not directing the communications on this web site to the residents of any of those states. Moreover, we will not offer or sell franchises in those states until we have registered the franchise (or obtained an applicable exemption from registration) and delivered the franchise disclosure document to the prospective franchisee that complies with applicable law. Contact us below to find out if and when we will be offering franchises in your state. Start your own business helping people who are suffering from chronic pain. Set your own hours and fee schedule. Work when and where you want to. Even if you have never hypnotized anyone, you'll leave our Certified Pain Escape Hypnotist training with real experience and the confidence that you can help everyone who comes to you for relief of pain. Our trainers are educators and certified hypnotism instructors with broad backgrounds and many years of experience in hypnotism. If you wish to operate a general hypnosis practice helping people with other issues for which hypnosis has been highly effective, we offer add-on training that culminates in a Certified Hypnotist designation from the International Association of Counselors and Therapists (IACT) and we also partner with other schools that offer advanced training. Many hypnosis certification organizations can teach you how to hypnotize someone, but they rarely teach you how to reach your desired pain management clients. We teach you a proven 3 step process to talk to doctors and dentists and get referrals. We provide brochures, business letters, and contact scripts to give you the best opportunities for success. You will have your own Local Office Web Page that provides all necessary contact information, your hypnotist biographies and certifications, and, if you choose, information your prospects will want to see on the results you have had treating a specific condition. We believe the "secret sauce" in the Pain Escape® Network is our database of client outcomes. You'll never have to wonder what sort of pain reductions your clients can expect for any given type of pain. You will have access to real-time statistics. After each successful hypnosis session, get permission to record a short video testimonial that will be uploaded to our web site. We give you some of the best-looking and most highly functional web pages to help promote your service to the public. Another "secret sauce" in the Pain Escape® Network is your access to other Pain Escape Hypnotists. Have a question about how to approach a particular issue with one of your clients? Need to know what experiences other Pain Escape Hypnotists have had with a specific problem? The Pain Escape Network connects you directly to our network of professionals who can answer your questions. Already Have a Business in the Health and Wellness field? Pain Escape certification, training, marketing tools, and the network features may be just what you've been looking for to build additional value for your existing wellness, coaching, chiropractice, massage, Reiki, or hypnosis business! Whether you are already conducting general hypnosis sessions or want to add the extraordinary results of hypnosis to your non-hypnosis practice, review the benefits above and let's talk about adding all the Pain Escape assets to your business. 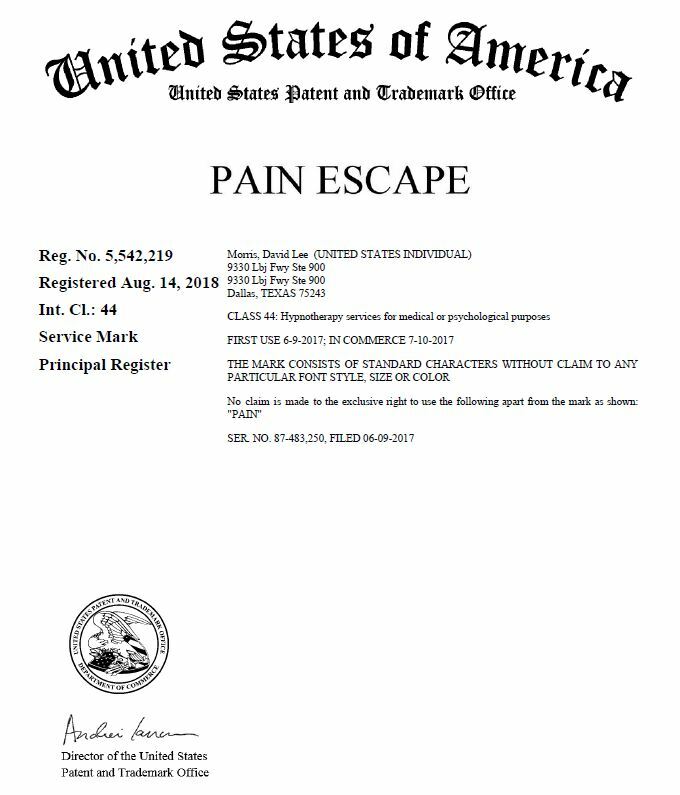 © 2017-2018 Pain Escape, LLC | Pain Escape® is a registered trademark of Pain Escape, LLC, and Using The Brain To Escape The Pain™ is a trademark of Pain Escape, LLC. Nothing on this web site should be construed to imply licensing by any state medical, dental, or psychology board. We are not physicians, dentists, or psychologists, nor do we practice any form of health care or mental health care that would require a license. We coach our clients on the use of self-hypnosis to achieve a more peaceful state of mind that is known through published research to be conducive to the alleviation of chronic pain, stress, and fears.